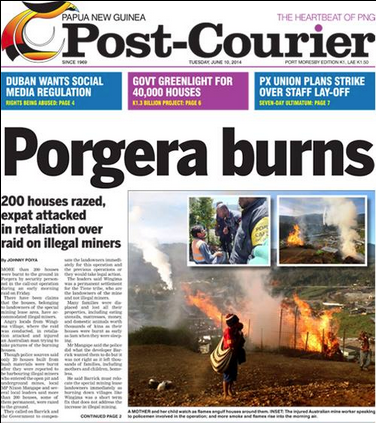 (Ottawa) In a pre-dawn raid on Friday, June 6, Papua New Guinea (PNG) police Mobile Units evicted residents from Wingima village near Barrick’s Porgera gold mine and burnt down some 200 houses, according to reports from eye witnesses in Porgera as well as from local Member of Parliament Nixon Mangape. Victims said they had no warning and were not given eviction notices in advance of the attack. In a repeat of house burnings in 2009, MiningWatch has been informed that this raid was also accompanied by Mobile Unit police violence against villagers and the rapes of at least ten women and young girls. The Tiene clan of Wingima, which was also targeted in 2009, are the traditional local landowners. People who have now lost shelter and the contents of their houses are Tiene landowners or relatives who can only live in the village at the invitation of the Tiene. Barrick’s Porgera Joint Venture (PJV) mine houses, feeds, and financially supports units of PNG’s infamous Mobile Units, in spite of their ­reputation for violence and their previous involvement in hundreds of house burnings in the mine’s lease area, as documented by Amnesty International. Following the 2009 house burnings, the Porgera Lando­wners Association (PLOA) reportedly obtained an order from the National Court of Papua New Guinea restraining the State from burning down more houses. However, reportedly, following a request by Barrick (Nuigini) Limited, the National Court removed the restraining order, arguing that the police has ultimate power to execute such operations under the terms of a State of Emergency (SOE). In April, a State of Emergency was called by the Government of PNG, leading to the deployment of additional Mobile Units to the Porgera Valley, to supplement those already supported there by the PJV mine. One reported goal of the SOE was to crack down on unauthorized scavenging of ore by residents living around the mine. Barrick Gold has not managed to stop dangerous incursions into the pit and across its massive waste flows of desperate people eking out a living. The mine and its uncontrolled waste flows have destroyed agricultural land and traditional subsistence activities. The raid took place while the leadership of the PLOA were away from the Porgera Valley. They had reportedly travelled to Kokopo, East New Britain, for a meeting with PJV’s Community Affairs Manager and representatives of the National Government, and the Provincial Government of Enga Province, where the mine is located. The meeting was an attempt to come to agreement on terms for a new Memorandum of Agreement (MOA) for the operation of the mine. The meeting reportedly broke down on Tuesday June 3. On the 5th of June, Barrick (Nuigini) Limited won a court order restraining the PLOA and its President, Mark Tony Ekepa, from interfering in the operations of the mine (attached). The raid started the morning of June 6th. See the 2011 OECD Complaint filed by MiningWatch Canada and Porgeran organizations regarding the house burnings, violence against local men and women by security guards and police, environmental concerns and the need for resettlement away from the mine, here. See the report by Amnesty International regarding the 2009 house burnings of: Amnesty International. 2010. Undermining Rights: Forced Evictions and Police Brutality Around the Porgera Gold Mine, Papua New Guinea, here. See the 2011 report by Porgera Alliance demanding resettlement here.